← Back, by POP-ular demand! As you might imagine, lunchtime at a food shoot is an event. We have a stash of take-out menus for every imaginable cuisine, and where to place the lunch order is always a lively debate. But, since we all love home-cooked food, we often enjoy our own creations. At the carriage house studio, we are fortunate to have access to a gas grill, so we’ve become quite expert at grilling pizzas for lunch. Try this, and you’ll never make a pizza by pre-heating your oven to 500° again! – In a large skillet over medium heat, sauté onions in butter, stirring often. When onions have softened, stir in sugar. Cook and stir until golden. Set aside. – Preheat gas grill to medium high. – Lightly brush baking sheet with olive oil. On lightly floured board, divide dough into 4 equal pieces. Using your hands, stretch each piece into rounds, approximately 7 inches in diameter. Transfer to baking sheet, and brush with olive oil. – Place rounds directly on grill; close lid. Cook for 2 minutes, then, using tongs, flip. Immediately spread each pizza with 2 tablespoons marinara sauce. Top with tomatoes and the caramelized onions. Sprinkle with cheese and Italian seasoning. Close lid. Cook 2 minutes longer or until cheese is melted and bubbly. – Sprinkle with sliced fresh basil. – If you can’t find fresh pizza dough, try your local pizza place. They may sell you a ball of dough. 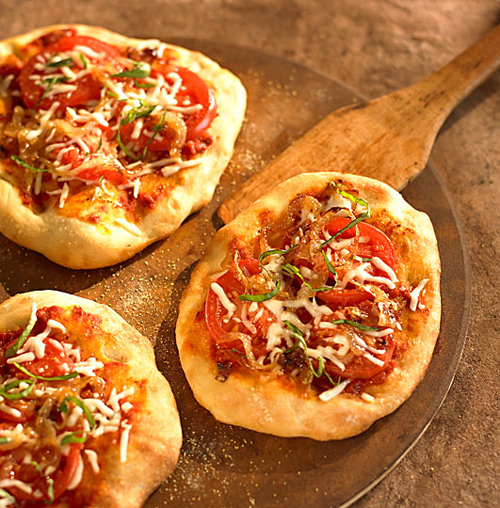 – An alternative to fresh pizza dough is 1 can (13.8 oz) Pillsbury refrigerated classic pizza crust. Remove crust from can; cut crosswise into 4 pieces. Continue with directions above for stretching each piece into 7-inch rounds. – Use different cheeses, such as shredded provolone, cheddar, or Monterey Jack. – Top with your favorite grilled veggies. – For a Mexican version, substitute salsa for marinara sauce; pepper jack cheese for the mozzarella; cilantro for basil. Mmmm… Thanks for the recipe. Great photograph! I think these would be perfect to make for our family when we are at the beach this summer. Let us know how you and the gals at work like the recipe. We get creative with our toppings, so we never really make it the same way twice! The gals at work asking for a grilled pizza recipe. What a coincidence! I was reading this the other. Can’t wait to try it & amp; get feedback from the others that try it.